As we move into December, the team is now in a full bug-fixing and polish mode, where all the new major features have been locked down. The team is now dedicated to fixing as many outstanding bugs as possible before entering large scale community play-testing. Please give us your strength during this time! In return, we'd like to give you a preview of what the following major patch will contain. As always, these features are still in development and may vary in their final form. Stick with us for more development updates! Coming in the next major version (Alpha v10), Squad gameplay as you know it will change dramatically. The Animation System overhaul may not sound like it changes much aside from aesthetics, but it is going to revolutionize how the game will be played. On top of that, several other changes to gameplay will mix things up quite a bit. Transitioning from standing to prone will no longer be instant, and you don't keep your sights on the target during it. This means that prone diving, previously a fairly common occurrence to instantly get dead-accurate hits, will be GONE. Bwahaha! Crouch Sprinting is also added to the game, meaning that you will be able to traverse distances with a lower profile, albeit at a slower pace than you would if you were standing up fully exposed. Vaulting will allow you to more quickly jump over small walls. Climbing will allow you to get over higher walls than was previously possible as infantry. This changes the playing field, as a simple rifleman's sandbag may be enough to scale a wall previously only accessible with a ladder. Another trick would be to use a vehicle as a booster which would allow you to climb over higher obstacles. Freelook will allow you to look around while doing any action while in infantry. This should slightly increase situational awareness while moving and reloading. Remember to watch your back! Weapon handling will change to feel more fluent and realistic, with a lot more polish in the way it moves and should feel much more immersive. Note that this will be the first iteration of this system and the precise sway/recoil/transition numbers will still be tweaked, and that the exact values we release with may not be the same as those shown here. However, the changes seen will still be in this direction. We will be slightly increasing sway effects when standing or after sprinting. This will put more emphasis on your posture and stamina, as well as taking your time to take your shots. This will benefit players who move carefully and deliberately. Good position and stance will give a more tangible advantage. The length of your weapon also now plays a factor in how you maneuver through tight spaces and fire from cover. When you are too close to an obstacle or a surface, your weapon will be forcibly lowered and you will be prevented from firing and aiming down your sights. This naturally depends on the weapon in question, so bringing a long marksman rifle into small CQB spaces will be ill advised, whereas pistols will have a natural advantage in tight situations. Scoped weapons will have reduced peripheral vision. This will reduce their spotting advantage at distance. The reticles also have been designed to allow for them to be used to gauge the fall of your shot. 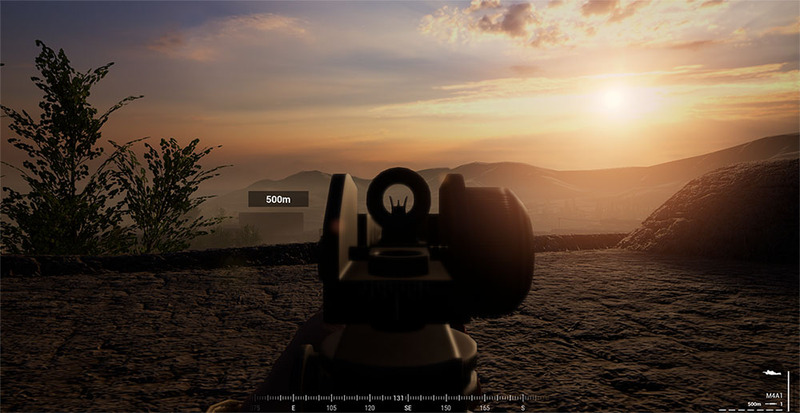 All infantry weapons (barring those with fixed sights) will have the ability for you to adjust their sights depending on the range of your target. This is especially useful for grenade launchers and dumb-fire rocket launchers as they rely heavily on the shooter accounting for the ballistic trajectory to score a first shot hit. Being able to adjust your sights to compensate for the distance to target will greatly improve the chances of a first shot hit. This feature is also included in all small arms as well, ranging from rifles to machine guns, even on the PPSh-41 submachine gun. Don't forget to hit the range to brush up on your skills, squaddies. A new role we have added is the Machine Gunner. A team-wide limited role, the Machine Gunner is packing a larger General Purpose Machine Gun (GPMG). Compared to the Automatic Rifleman's LMG, the Machine Gunner's GPMG is typically a larger caliber weapon capable of putting down suppressive fire out to much longer distances and can penetrate more surfaces with greater reliability. Due to the size and weight of the GPMG, it is generally unsuitable for firing either on the move or in CQB situations. We will be introducing the M240B and the PKM with this new role. Bipods will allow Light Machine Guns (LMGs) and General Purpose Machine Guns (GPMGs) to set up on positions and put down a large volume of fire with terrifying accuracy. The Automatic Rifleman and Machine Gunner roles intention were to provide suppression. In reality, they were often quickly picked off by Marksmen or Riflemen with optics, as they were limited in their ability to effectively return fire at range. With the introduction of bipods, from what we've seen so far, the machine gun is a force to be reckoned with. It is VERY deadly, even at range, when set up with a bipod. The changes to sway and prone diving (see above) give the automatic rifleman a much larger window to fire when after an enemy has been spotted, before taking return fire. The best way to deal with an Automatic Rifleman is to flank them, because they will have the power to simply make swiss cheese out of you if you try to attack from the front. Furthermore, each squad will have access to an extra Automatic Rifleman outside of the special kit restrictions, allowing a squad more freedom to pick other specialty kits as well. After reviewing community and internal feedback, we have decided that we are unhappy with the "Rush the first enemy flags" AAS meta, as it is an unforgiving type of gameplay that fails to put emphasis on the gradual capping of flags and territory that AAS was designed around. To address this, non-capturable flags will no longer be blockable by the enemy. For example: if one soldier is in the capture zone of their team's first flag and nine enemies are in that cap zone as well trying to block it, the flag will still be captured. Once they find him and kill him, the flag will (obviously) stop capping. This should severely reduce the "Rush Flags" meta, and shift the focus more towards the linear progression of moving from flag area to flag area, as well as having a proper supply train with FOBs and logistics. Blocking a flag is technically still possible if you eliminate the entire attacking force, but it will require more resources to do and is more likely to fail. Entering or exiting vehicles and switching seats inside vehicles is no longer instant. The duration depends on the vehicle and the type of seat. This greatly reduces the effectiveness of soloing vehicles when a vehicle is flanked or ambushed. Either it will not be able to drive away or it won't be able to return fire instantly. Bring a friend! Several vehicles will have access to secondary weapons and different ammunition types. For example, the Russian BTR-82A will have access to 30mm High Explosive (HE) ammunition which deal explosive damage suitable for dealing with infantry, in addition to its normal 30mm Armor Piercing (AP) rounds. BTR and BRDM variants also have access to a secondary coaxial machinegun. Some vehicles also have access to smoke launchers, providing a way to either conceal their movements or aid infantry by providing a large smokescreen. One change that we're implementing to Logistics is for the Logistics carrier to load on varying amounts of either construction or ammunition points. For example, an Ural supply truck has 2000 points worth of space to load either construction or ammunition. If a FOB in the front is running mortars or simply just needs more ammo, the truck can run a full load of ammo rather than wasting half of that space to haul unneeded construction materials. Unsecured oversized loads will be issued a moving citation. The process of loading and unloading is now treated like a weapon on a vehicle, in that Construction and Ammo occupy different inventory slots, and one button (Default: Left Mouse Button) will unload, and another (Default: Right Mouse Button) will load supplies onto the vehicle. Instead of a 3-minute pre-match spawn timer, there will be a 3-minute staging period before matches. During this time, you can spawn in at your team's Main Base, organize your squads, roles, get to your vehicles, and prepare to move out. However, you are unable to leave the Main Base area until the timer has fully elapsed. To prevent griefing issues, you cannot fire your weapons during the staging period. We're supremely grateful for the community we have and we absolutely do not want to disappoint, despite taking us this long to get our next major release together. Please stay tuned for further updates as our team is on overdrive in hammering out the bugs. The game is becoming more tactical, more smooth, and more polished all in one patch! The logi rework, staging times and anti-rush meta will definitely make the game better at a strategic level, and the animation changes seem like it will make the game less chaotic and more teamwork based. Thumbs way the **** up. Looks awesome, was hoping for some teases for upcoming content but still very happy. Those HE rounds though... lordy the Americans are going to need some help soon. What a read, so much nice stuff in this one. Can´t wait to play. Let's all hope for a pre-christmas release! That PKM crawling animation is my new favourite thing. Let me go change my pants. Awesome news, awesome update ! Keep up the good work guys ! Cant wait to get my hands on it ! MG class is more expectable!! If you read the recap properly, you should see why you're wrong. Gameplay is going to be completely different, even just due to the handling changes alone. As stated, this is NOT merely cosmetic. It will change the way you (can) move, it will change the way you shoot, it will change the way you work together. Honestly, this is in the same league of "change" as when vehicles were first introduced. It really is that big. Feels like a whole new game. You'll see when it hits. Coming in the next major version (Alpha v10), Squad gameplay as you know it will change dramatically. The Animation System overhaul may not sound like it changes much aside from aesthetics, but it is going to revolutionize how the game will be played. Very good stuff here, can't wait for it! I hope the update and community testing isn't that far out... There will be an adjustment period for all, and seems like a step in the right direction. Great work now we need to get our hands on it. If you read my comment properly you can see that i do think that these changes will most certainly improve the gameplay. However it will not scale the battlefield and will not (from the looks of it) have the same impact on the gameplay as when they added ie vehicles. This game has recently become something i do enjoy playing but feels like the progression to become the "PR-successor" is taking longer than I hope for. When do we get our clan patches? Looks ****ing insane guys ! great job ! it was worth the wait to see this recap , and here again you proved that you are listenig to the community feedback , thank you ! 2 . will there be a ladder climbing amination aswell ( as seen in the motion capture videos ) ? 3 . does the bug when weapons clips through walls is fixed with weapon coluision system ? 4 . AND MOST IMPORTANTLY !!! - for a very long time we have been told that one of the reasons that the game is having perfomance issues has something to do with the current animation system ( skeleton something.... ) DOES the new animation system brings with it better performance ?